As Winnipeg implements its plans to build outward and upward, the squeeze on greenspace, urban canopy, and natural areas is being felt more keenly than ever. There is an urgent need for a greenspace plan to protect the remaining fragments of our natural heritage and address greenspace deficits in many neighbourhoods. 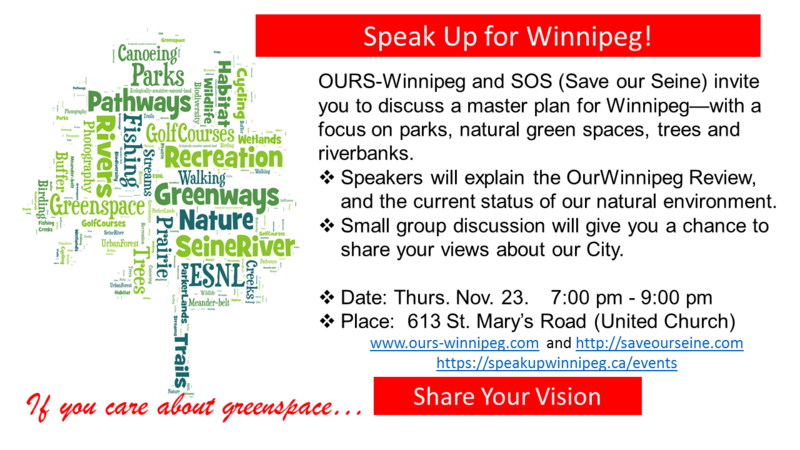 OURS-Winnipeg and Save Our Seine are pleased to host this event to discuss the city’s overall plan for Winnipeg (OurWinnipeg) – with a special focus on parks, ecologically-sensitive natural lands, rivers, golf courses, and other green spaces. Brief presentations about the OurWinnipeg review process and the status of Winnipeg’s natural environment will be followed by round-table discussion in small groups. If you care about greenspace – come to this meeting to share your views about the future of our city.